This set includes 4 Salt Bar Soaps: 1 Lavender Bliss, 1 Tea Tree Cleanse, 1 Rosemary Rejuvenation, 1 Coffee Purge. Experience the energetic cleansing of a salt shower with these natural organic soaps that are infused with consecrated essential oils! Natural soaps made by cold process method retain all of the glycerin produced during the soap making process, leaving your skin feeling clean, silky and smooth. Salt has also been added to these soaps, making it a wonderful salt scrub in a bar! Not only does a salt soap exfoliate dead skin cells, salt also has antiseptic qualities and energetically helps to remove and breakdown negative & diseased energies. The organic vegetable oils, essentials oils, botanical herbs and colorants ensure that what goes on your skin is good for your skin! As an added bonus all the oils used in these soaps have been energized by Master Co to augment their cleansing and healing properties. All natural, handmade organic cleanser with Lavender Essential Oil and Lavender Flower Buds to give you a soothing, calming, uplifting bar of soap. Lavender is known for its soothing skin healing properties and is antibacterial, antidepressant & anti-inflammatory. Contains green and violet pranas. Organic Ingredients of Tea Tree, Spirulina & Lemongrass make this a power packed soap full of nutrients for the skin. 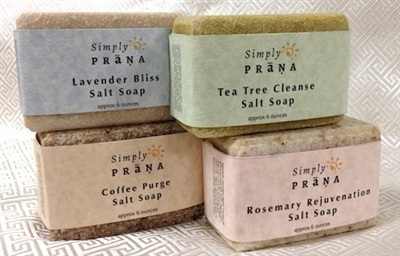 Each of these ingredients also contain green prana, making this a concentrated soap of green cleansing energies. Leaves you feeling light and refreshed! Enjoy the invigorating & strengthening properties of red prana from Rosemary Essential Oil to start your day! The combination of Rosemary and Salt make this soap powerful cleansing & energizing treat! On top of that, crushed rose petals have been added to infuse the bar with emotionally uplifting energies! Don't let the name scare you! This soap has amazing cleansing action! We've combined Tea Tree Essential Oil with Ground Coffee to give you a deep powerful cleanser for Life's more challenging days. Contains green and orange pranas. Due to the nature of our handmade process, each bar is unique. Size, shape and color may vary slightly. Each soap is approximately 6 ounces. I bought the Salt Soap Gift Set for my mother and she Loves it; She says it smell delicious and always feels rejuvenated and relax after using it. I wish I can get it for myself and many other things from this website but the shipping to Canada is way too expensive , I wish it could be less. Welcome to the World of Prana and the official bookstore of PranicHealing.com and Master Stephen Co!